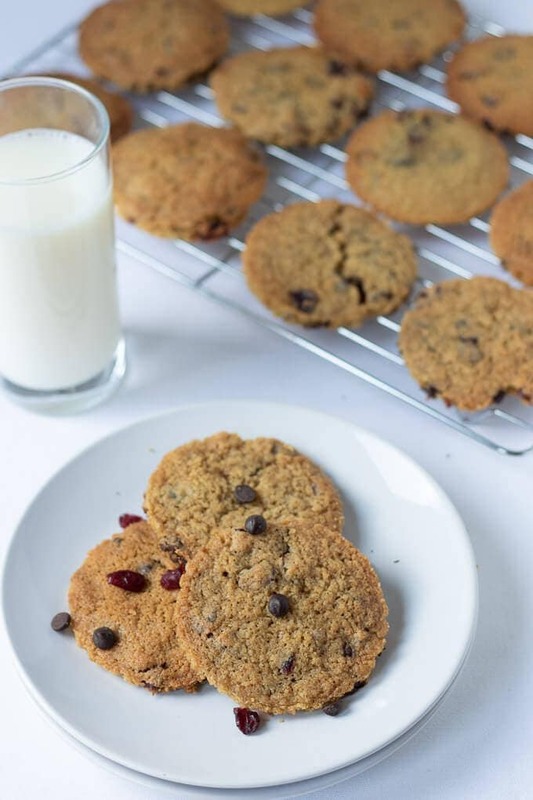 Dark chocolate chip cranberry cookies are delicious sweet soft and chewy holiday treats. The combination of melted dark chocolate chips and sweet cranberries is irresistible! 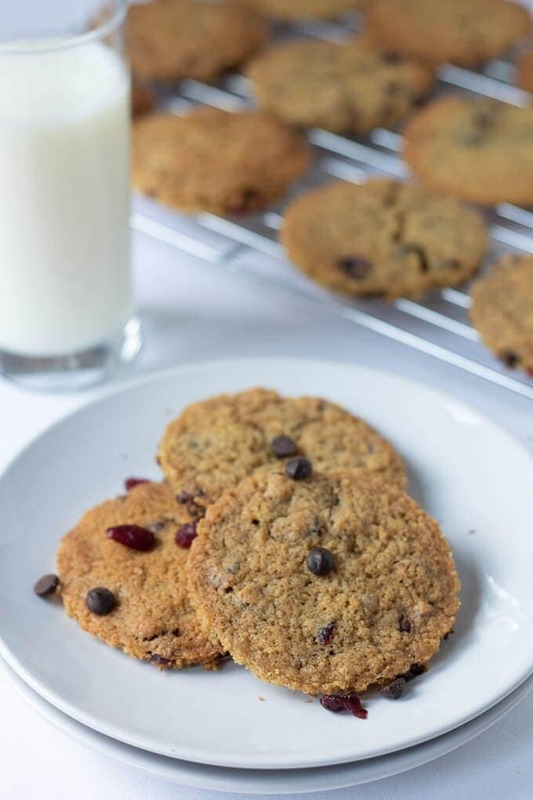 Folks these dark chocolate chip cranberry cookies are irresistibly soft and chewy. They’re full of delicious sweet cranberries and melted dark chocolate chunks. Incredibly easy to make, I can guarantee these will disappear fast from your kitchen! Seeing as it’s Christmas I decided to “loosen” the healthy theme of my blog. So these chocolate chip cookies should be eaten as a treat. After all we all need to treat ourselves at Christmas don’t we? 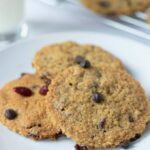 However, if you are looking for a healthier cookie, then do hop on over to check out my wholemeal chocolate cranberry cookies! When you bake these in your oven and then take them out, it’s highly unlikely they’ll look as neat and round as mine do. No, I will confess to you folks that I used a round cookie cutter to make these look as they do for the photographs. So don’t worry what your cookies look like when they’re baked. Just enjoy them! More christmas recipes for you next week folks! A number of years ago I made chestnut soup as a starter for our Christmas Day dinner when I was still living with my parents. So I’ve recreated that recipe and it’ll be out on Tuesday. Then on Thursday a recipe from my childhood that my mum used to bake with me. Chocolate Snowballs. This recipe is so simple and needs hardly any ingredients nor any baking so do check back then for that! So I hope you can join me for both recipes next week! 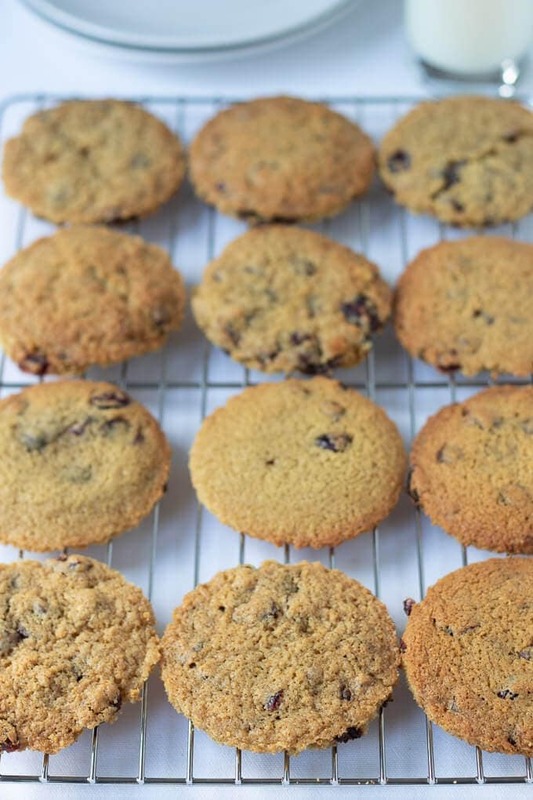 These delicious chewy cookies are perfect for the holidays. Make sure you share them though as they’re rather tempting!! 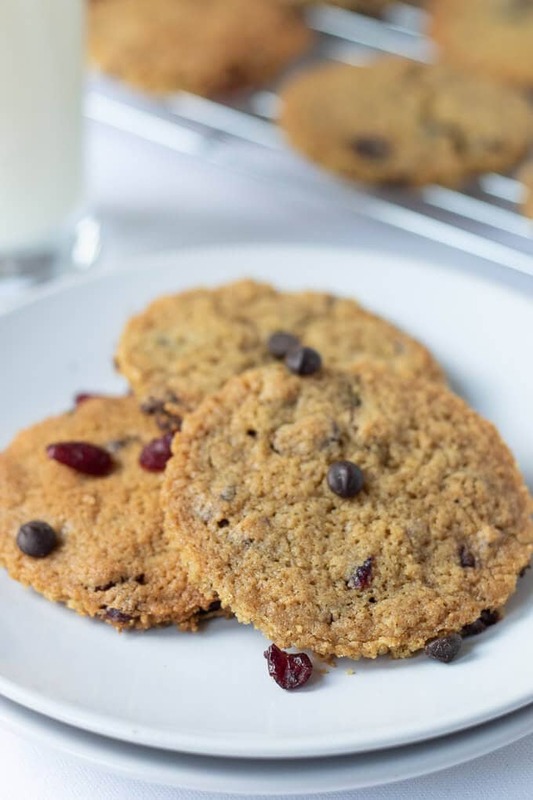 Dark chocolate chip cranberry cookies are delicious sweet soft and chewy holiday treats. 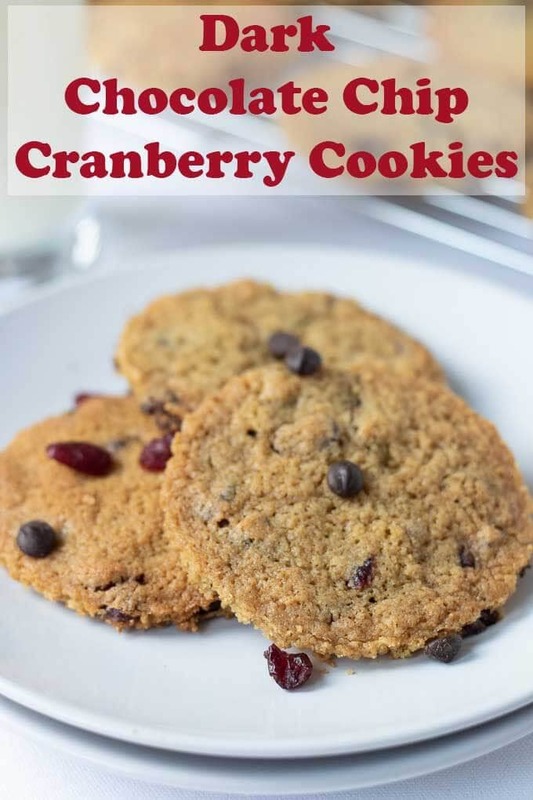 The combination of melted dark chocolate chips and sweet cranberries are irresistible! Pre-heat your oven to 180°c. Lightly grease a couple of baking trays. In a large mixing bowl, beat together the butter and both sugars until creamy. Add the vanilla extract and eggs, beat well into the creamy mixture. Fold in the flour, bicarbonate of soda, dried cranberries and dark chocolate chips. The dough should be of a smooth consistency. Tear off golf ball sized pieces, roll them into balls using your hands, place them on the baking sheet about 5cm apart and press down slightly to flatten them. Place the cookies in the oven and bake for 15 - 20 minutes until golden brown and cooked through. Keep the cookies in an air-tight sealed container. The cookies will be good for a week. Previous Post: « Climbing Kilimanjaro Day 5. Summit Day. Oh yes!!! Such a lovely combination. My favorite Christmas cookie that I’ve made a few times is a cranberry hazelnut cookie. I should add chocolate to those! That’s a very interesting, Christmassy combination! I love cranberries in desserts…especially around the holidays! And while I’ll never turn down a cookie, I must say that I’m often partial to a crunchy cookie. This sound delicious, and I love the cranberry + chocolate combo you’ve got going on here, Neil!